A hunter is being criticized for apparently killing a mountain lion in Colorado and posting bloody photos with its corpse. The hunter, Franchesca Esplin, posted graphic photos of herself and the lion's body on Facebook in late December. In one video, she holding the animal's bleeding corpse. In another, she's holding her hands up, as if to show off the blood. Esplin also posted a video of her shooting the lion in a tree and it crying out upon apparently being hit. In late February, the Facebook page of Prairie Protection Colorado, an animal conservation group, posted the images and video to its own page, where the y went viral. The comments were overwhelmingly negative. "This is not a sport. This is murder," one top-voted commenter wrote. "Disgusting, this makes me sick! How could someone enjoy taking the life of this majestic animal?" wrote another, "Beyond sad." Esplin justified killing the mountain lion. In an interview Tuesday with KDVR, a Colorado-based Fox affiliate, she said that the hunt was legal, that she "used the entire lion," and that hunting is part of her heritage. Colorado Parks and Wildlife, which manages state parks, told KDVR it didn't plan to investigate Esplin because the hunt was legal. 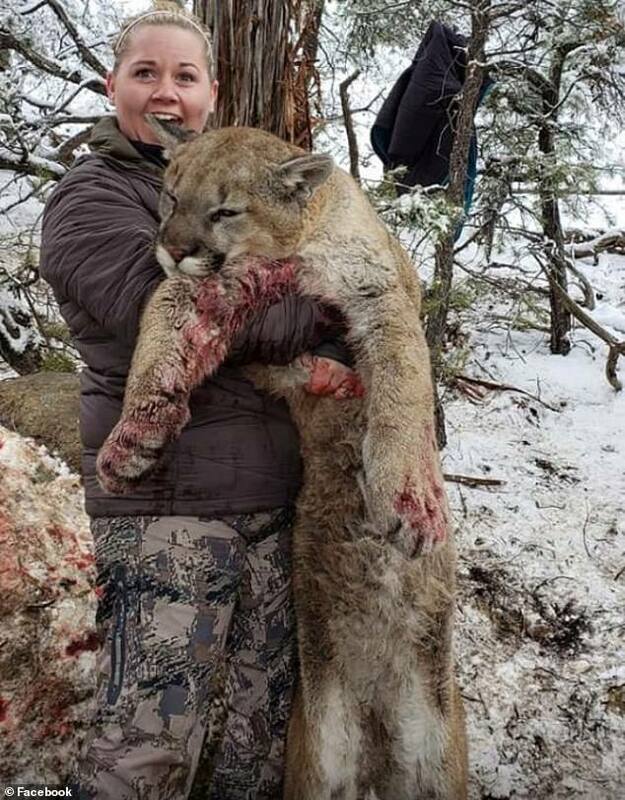 Deanna Meyer, the executive director of Prairie Protection Colorado, told Yahoo that Esplin's actions were a "trophy kill" and said she expressed "pure psychopathic evil" with her photos. Hunting mountain lions and bobcats is legal in Colorado with a permit and during certain parts of the year, but Meyer said her group is petitioning state lawmakers to ban it altogether. "I do not find anything wrong at all with ethical hunting," Meyer said. "To me, that doesn't include selfies of the dead animal with laughing and elation."